The name of the Capri camper trailers is well known in the RV industry. These trailers that have a great design for functionality and convenience are manufactured by Coachmen. The story of Coachmen has changed a lot since 2008 when they sold their assets to Forest River. Forest River is another well known RV company that manufactures motorhomes and trailers of all kinds and has won a world wide known reputation. Some of the legacy of Coachmen still lives on through the products of the latter brand. The Capri camper trailers have great features that come from their ideally small size and surprising comfort. One of the objectives of the company when they created their Capri models was to combine the comfort of the average camper with a smaller, more affordable version of travel trailers. This is how this lovely looking camper was born. With these camper s you can still easily drive wherever you want without spending money on too much gas, yet you will enjoy yourself in a comfortable environment no matter where you are. The price of these campers is also one of their pros, since compared to what they offer they are cheaper than many other travel trailers out there on the market. The design of the Capri campers combines the classic look of a travel trailer that so many people love, at the same time maintaining functionality on the highest levels possible. Small size trailers often have the fallback of not having enough storage room and less comfort, but the Capri camper is an exception. It has everything you would need while traveling: a nice dinette, a shower with toilet, sleeping area that can be a living area during the day, a kitchen space and more. It also comes with a lot of facilities in one package, so you won’t miss the fridge, the stove and the air conditioning either. The Capri Micro is the smallest model of all the Capri trailers. It is perfect for a weekend romantic camping experience, and it is a cheaper way of enjoying nature and the outdoors. Plus you won’t need a large truck to tow this camper, a middle sized SUV is perfectly fine. The average weight of such a camper is around 3,000 lbs. This is lightweight for a camper and it will save you a lot on fuel. Compared to its small size, this Capri Micro camper is actually very roomy and comfortable. You will have enough space inside for two people comfortably and even have some storage space. There are different floor plans that this camper is available in, with the largest one having four sleeping spaces and the smallest one two. The large windows which are big compared to the size of the camper give you more light and a feeling of more space inside. Not only that this small camper comes with a shower and a toilet, but it has a dry bathroom which means that there is a separate toilet space and a separate shower space, so you don’t have to wet the toilet every time you shower. 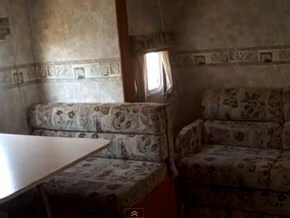 RVs.com is an online store where you can find used travel trailer, including some of the more rare designs. You can easily search for the desired trailer thanks to their easy search system. You can look for a Capri trailer also according to its location or its price, which makes it easier to find one in your area. If you want to find a local RV, you can simply call the number listed on the website and avoid a lot of hassle. Just like the name suggests, this is a place where you can find everything related to camping. They have for sale both new and used campers of all kinds, accessories and camper parts as well. Camping World is a reliable and easy to follow website. They have various Capri models for sale. They have several super centers, so if you don’t like online shopping, you can just look up the closest store next to you and talk to a dealer directly. Those who are looking for only the best and simplest cab over campers often consider Capri Campers to be the very best. With several great models to choose from, as well as a price under $8,000, this is one of the most affordable options that are available for people who are simply looking for a suitable camping situation for themselves while they are traveling. With several designs that range from spacious to rather cramped Capri campers are all designed as cab over models. And with a wide range of features including showers, refrigerators, seating areas, stoves and microwaves these great little cab over campers make the perfect option for people who are looking for a comfortable camper on a budget. With the cheapest camper they offer coming in at less than $2,000 you can definitely say that Capri camper trailers are designed to be very affordable, and with numerous options that can be added onto most models you can create and design your very own camper that suits your needs exactly. So why settle for a company that has very few models to choose from and has not been in business long? Capri campers have been around for over 30 years, and with the great prices and wonderful products that are offered, you are sure to find that Capri really is one of the best camper companies on the market today for those who are only looking to find an affordable cab over camper for their traveling needs. Remember, from small, cramped, to the plush, and decked out you are sure to find the perfect cab over camper for your needs from Capri campers. So take some time to look around and pick out your favorite modeXl, who knows you may suddenly find yourself doing a lot more camping.